If there was ever a time when you, your kids or any other individual needed to learn how to speak good English, it is NOW. Grab all the INTERACTIVE PHONICS book series and you are great to go. Almost all of the series come with a read along video CD which helps to make learning FUN. 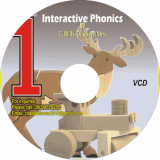 Interactive Phonics books: Kindergarten to Book 5 have the video embedded into the book.